Before I can get on with my review of Bloody Zombies it is essential I mention a few things which have certainly coloured my enjoyment with the game, and which have influenced the path of what I am about to say. Firstly I didn't complete the game, I reached the final level but it was just too damn hard to beat. This goes onto my second knowledge bomb; I only played this game in single player, as with every single scrolling beat-em up ever made the fun increases the more players you have. I did try and play online with other people but the servers for Bloody Zombies are pretty dead. My final footnote is that I played this in VR, going the other way I feel this would be a lot more bland outside of the virtual world. Zombie apocalypse has come to the U.K but it has been contained within the boundaries of London thanks to the K.R.O.N.O.S Corporation who have built huge walls around the capital. A year since the outbreak occurred four survivors; Teller, Mick 'The Brick', Rei, and Eddie happen upon each other just as a K.R.O.N.O.S copter crashes in the street. They are informed by a transceiver they find in the wreckage that they need to use a homing beacon to locate the key cards of 4 key members of the company in order to get into the H.Q where the cure for undead apocalypse awaits. 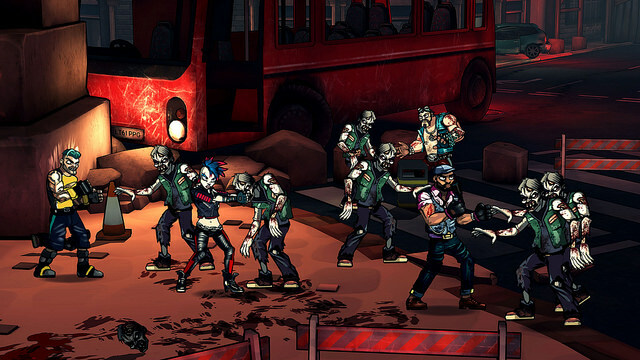 Bloody Zombies is a classic style 2D scrolling beat-em up that has up to four players fighting through the over run streets of London. The graphics are cartoon like and reminded me quite a bit of the hand drawn style of The Dishwasher series of games. Each level takes place in a different location as is the way, these include a graveyard, a train, London bridge, the Natural History Museum, a night club and more. It was cool to have a game entirely set in London and made for some detailed environments. There is variation in the levels in that your not just fighting your way to the end, but occasionally have little missions to do. In the night club for example you have to destroy the speakers to stop zombies being attracted by the noise. At other points you have to survive against waves of enemies as you try to use switches and raise bridges. So far so normal but it is the VR which really adds so much here. In VR you are watching the game from slightly a far, by looking left and right you can see the entire 2D level stretching out, and are also able to see parts of the background which you can get into to find secret weapon caches. The characters and monsters all take on a South Park style flat paper look to them which is very attractive looking. This added a lot purely in terms of how pretty everything looks, like you are viewing a moving diorama. Levels contain a variety of weapons to collect that have limited use to them before they fall apart. There are also shops you can use to purchase upgrades (more on that later). There are also plenty of traps dotted around the levels that helped break up the fighting parts with some mild platforming. Each of the four characters have slightly different moves to them, some are faster than others, some are stronger, again as you would expect. The monsters on the other hand are very varied, it seemed almost up to the final level new enemies were being introduced, there is a surprising amount of them. Mostly these are all variations on ghouls, such as ones who can throw bones, others who have spikes protruding from their bodies meaning they can't be grabbed, teleporting ones, and armoured ones etc. Each level ends in a boss fight against a gigantic foe. The problem with the enemies is that as they are all zombies they don't really look too different to each other, the bosses in particular are all just huge blobs of flesh. I had quite a few problems playing Bloody Zombies. 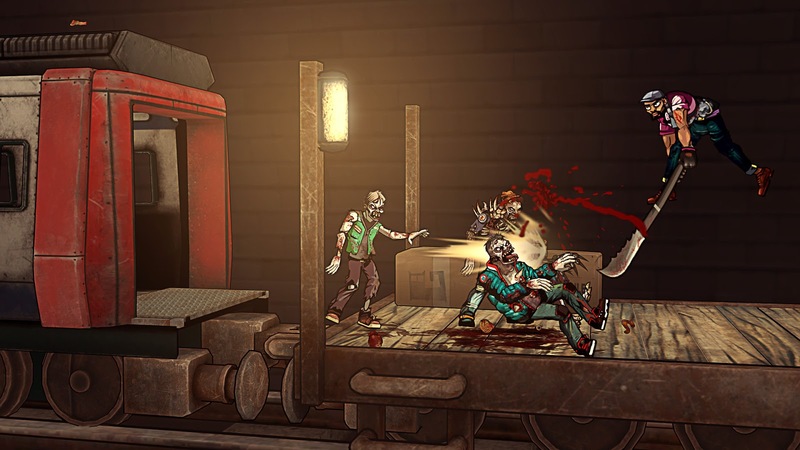 The combat felt a bit off at times, say for example you knock a zombie to the ground, it stays there for a while before getting up but there is no button that allows you to attack a fallen foe. You unlock more and more special moves as you progress but I confess I couldn't actually work out how to do these moves, either that or they all look identical on screen. The majority of the game is pretty easy, in a fun way, then comes level 10 which took me a few attempts, fair enough, but then the final level...the final level is ridiculously hard, so much so that I wasn't able to get more than a third through it before losing all my lives, the enemies just pound you from all sides with projectiles, while the larger enemies have an annoying habit of coming to the front of the screen and blocking a large percentage of it with their mass. It would have been helpful to have them become semi-transparent or something. The most damning part of the final level is more to do with fundamental game bugs. By this I mean the game has around a 60% chance of simply failing to load the final level in the first place, I lost count how many times trying to load it the game would crash on me, pretty pathetic. Up until the final level I was having fun with Bloody Zombies, I loved the setting, and it all looks so damn pretty in VR, a high difficulty spike ruined the experience, I have seen people complete it in single player so must be possible, but not for me. This is also a decent length, it was at least two hours to get to that last level, with 11 in total that take between 15 to 20 minutes each on average. 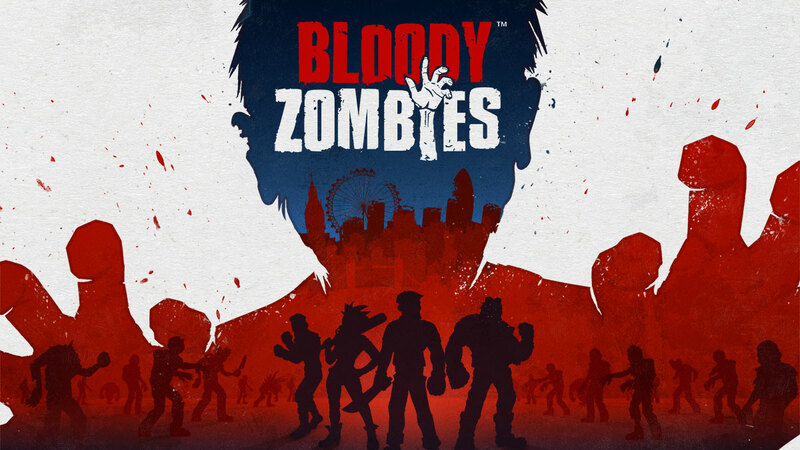 If you're playing this with friends then add on a couple of zombie heads to my score. If you're playing this in regular mode and not using a VR headset then maybe knock a couple of heads off. For me though this was a great looking game that couldn't hide some at times bad gameplay decisions, get it if you see it cheap (like I did) but don't expect to be blown away.